Species is common and widespread, but under significant threat of catastrophic declines due to White-Nose Syndrome, a fungal disease responsible for the collapse of populations of this species in the eastern US. CommentHabitat is likely stable within +/- 25% since European settlement. Species readily uses buildings and bridges as active season roosts, so any potential decrease in tree or rock outcrop roost has likely been offset through use of these structures. CommentWithin the last 10-15 years, this species has been detected frequently on acoustic and mistnetting surveys across the state, with no apparent positive or negative trend is abundance or frequency of capture. Based on this, the population status is probably best regarded as stable within +/- 10%. CommentThe extent of WNS impacts in the west is currently unknown. If the disease dynamics are similar to the east coast, we may see declines of up to 100% for this species (High). Because many of or bats overwinter in hibernacula outside of caves, disease transmission dynamics may differ for western popualtions. CommentVery few of our bats hibernate in caves and mines so if WNS only affects individuals using these features, Scope will be Insignificant. However, if individuals that overwinter in rock outcrops are susceptible to this disease the Scope will be High. CommentBased on the average rate of spread, we should expect to detect WNS or the causal pathogen to reach Montana within 5 years. ScoreB - Moderately Vulnerable. Species exhibits moderate age of maturity, frequency of reproduction, and/or fecundity such that populations generally tend to recover from decreases in abundance over a period of several years (on the order of 5-20 years or 2-5 generations); or species has moderate dispersal capability such that extirpated populations generally become reestablished through natural recolonization (unaided by humans). CommentSpecies is long lived and has low fecundity. As these animals can fly, dispersal to and recolonization of extirpated populations is possible. CommentDuring the active season species uses a variety of habitats with roosts and water as limiting factors. Hibernates in caves and mines in Montana but may also use rock outcrops including talus slopes. The most common bat species in Montana (Foresman 2012). Cinnamon-buff to dark brown above, buffy to pale gray below; hairs on back have long glossy tips; ears, when laid forward, reach approximately to the nostril; tragus about half as high as ear; calcar without keel; length of head and body 41 to 54 mm, ear 11.0 to 15.5 mm, forearm 33 to 41 mm; braincase rises gradually from rostrum; greatest length of skull 14 to 16 mm; length of upper toothrow 5.0 to 6.6 mm (Hall 1981). This species is resident year-round in Montana, but may be partially migratory because known winter aggregations are much smaller than the apparent size of summer populations. Found in a variety of habitats across a large elevation gradient. Commonly forages over water. Summer day roosts include attics, barns, bridges, snags, loose bark, and bat houses. Known maternity roosts in Montana are primarily buildings. Hibernacula include caves and mines. Mostly insects, including gnats, mosquitoes, crane flies, beetles, wasps, and moths. Prey often caught with tip of wing then transferred immediately to mouth. Males and females mostly segregated during summer, females often in maternity colonies of up to a thousand individuals or more. Can live more than 30 years. Females have one young per year, usually born late June and July. Maternity colonies are vulnerable to exclusion from buildings; bat boxes attached to the building that formerly housed the colony may provide alternate roosts if properly designed and placed to offer warm temperatures, wide internal temperature gradients, and sufficient width to allow many bats to roost side by side (Brittingham and Williams 2000). Brittingham, M.C. and L.M. Williams. 2000. Bat Boxes as Alternative Roosts for Displaced Bat Maternity Colonies. Wildlife Society Bulletin. 28(1): 197-207. Abernethy, I.M., M.D. Andersen, and D.A. Keinath. 2012. Bats of southern Wyoming: distribution and migration year 2 report. Prepared for the USDI Bureau of Land Management by the Wyoming Natural Diversity Database, University of Wyoming, Laramie, Wyoming. Adams, R.A. 2003. Bats of the Rocky Mountain West: natural history, ecology and conservation. University Press of Colorado: Boulder, CO. 289 pp. Adams, R.A. 1997. Onset of Volancy and Foraging Patterns of Juvenile Little Brown Bats (Myotis lucifugus). Journal of Mammalogy 78(1): 239-246. Adams, R.A., S.C. Pedersen, K.M. Thibault, J. Jadin, and B. Petru. 2003. Calcium as a Limiting Resource to Insectivorous Bats: Can Water Holes Provide a Supplemental Mineral Source. Journal of Zoology 260(2): 189-194. Agnarsson, I., C.M. Zambrana-Torrelio, N.P. Flores-Saldana, L.J. May-Collado. 2011. A time-calibrated species-level phylogeny of bats (Chiroptera, Mammalia). PLoS Currents Tree of Life. Edition1. RRN1212. Agosta, S.J., D. Morton, B.D. Marsh, and K.M. Kuhn. 2005. Nightly, Seasonal, and Yearly Patterns of Bat Activity at Night Roosts in the Central Appalachians. Journal of Mammalogy 86(6): 1210-1219. Aldrich, H. 1986. Manoeuverability and ecological segregation in little brown (Myotis lucifugus) and Yuma (M. yumanensis) bats (Chiroptera: Vespertilionidae). Canadian Journal of Zoology 64:1878-1882. Aldridge, H. 1986. Manoeuvrability and Ecological Segregation in the Little Brown (Myotis lucifugus) and Yuma (M. yumanensis) Bats (Chiroptera: Vespertilionidae) (English). Canadian Journal of Zoology 64(9): 1878-1882. Amichai, E., G. Blumrosen, and Y. Yovel. 2015. Calling louder and longer: how bats use biosonar under severe acoustic interference from other bats. Proceedings of the Royal Society B: Biological Sciences, The Royal Society 282(1821): 20152064. Anthony, E.L.P. and T.H. Kunz. 1977. Feeding strategies of the little brown bat, Myotis lucifugus, in southern New Hampshire. Ecology 58(4): 775-786. Anthony, E.L.P., M.H. Stack, and T.H. Kunz. 1981. Night roosting and the nocturnal time budget of the little brown bat, Myotis lucifugus: effects of reproductive status, prey density, and environmental conditions. Oecologia 51(2):151-156. Arnett, E.B. 2007. Presence, relative abundance, and resource selection of bats in managed forest landscapes in western Oregon. Ph.D. dissertation, Oregon State University, Corvallis, Oregon. Avery, M.I., P.A. Racey, and M.B. Fenton. 1984. Short distance location of hibernaculum by little brown bats (Myotis lucifugus). Journal of Zoology 204(4): 588-590. Bachen, D.A, and B.A. Maxell. 2014. Distribution and status of bird, small mammal, reptile, and amphibian species, South Dakota Field Office-BLM. Report to the Bureau of Land Management, South Dakota Field Office. Montana Natural Heritage Program, Helena, Montana 25 pp. plus appendices. Bachen, D.A., A. McEwan, B. Burkholder, S. Hilty, S. Blum, and B. Maxell. 2018. Bats of Montana: Identification and Natural History. Report to Montana Department of Environmental Quality. Montana Natural Heritage Program. Helena, MT. 111pp. Baker, R.H. and C.J. Phillips. 1965. Mammals from El Nevado de Colima, Mexico. Journal of Mammalogy 46(4): 691-693. Barclay, R.M.R. 1984. Observations on the migration, ecology and behaviour of bats at Delta Marsh, Manitoba. Canadian Field-Naturalist. 98(3): 331-336. Barclay, R.M.R. 1991. Population Structure of Temperate Zone Insectivorous Bats in Relation to Foraging Behavior and Energy Demand. Journal of Animal Ecology 60(1): 165. Barclay, R.M.R. and D.W. Thomas. 1979. Copulation call of Myotis lucifugus: a discrete situation-specific communication signal. Journal of Mammalogy 60(3): 632-634. Barclay, R.M.R. and K.J. Cash. 1985. A non-commensal maternity roost of the little brown bat (Myotis lucifugus). Journal of Mammalogy 66(4): 783-783. Barclay, R.M.R., C.E. Thomson, and F.J.S. Phelan. 1982. Screech owl, Otus asio, attempting to capture little brown bats, Myotis lucifugus, at a colony. Canadian Field-naturalist. 96(2): 205-206. Barclay, R.M.R., M.B. Fenton, and D.W. Thomas. 1979. Social behavior of the little brown bat, Myotis lucifugus: II. Vocal communication. Behavioral Ecology and Sociobiology 6(2): 137-146. Barclay, R.R. 1982. Night Roosting Behavior of the Little Brown Bat (Myotis lucifugus). Journal of Mammalogy 63(3): 464-474. Barnhart, P.R., and E.H. Gillam. 2014. The impact of sampling method on maximum entropy species distribution modeling for bats. Acta Chiropterologica 16(1): 241-248. Bat Conservation International. G4 Harp Trap: Assembly and Advice. 8 p.
Baxter, D.M., J.M. Psyllakis, M.P. Gillingham, and E.L. O'Brien. 2006. Behavioural response of bats to perceived predation risk while foraging. Ethology 112(10): 977-983. Bell, J.F. and L.A. Thomas. 1964. A New Virus, "MML," Enzootic in Bats (Myotis lucifugus) of Montana. American Journal of Tropical Medicine and Hygiene 13(4): 607-612. Bell, J.F., G.J. Moore, G.H. Raymond, and C.E. Tibbs. 1962. Characteristics of Rabies in Bats in Montana. American Journal of Public Health 52(8): 1293-1301. Bell, J.F., W.J. Hadlow and W.L. Jellison. 1957. A survey of chiropteran rabies in western Montana. Public Health Reports. 72(1): 16-18. Belwood, J.J. and M.B. Fenton. 1976. Variation in the diet of Myotis lucifugus (Chiroptera: Vespertillionidae). Canadian Journal of Zoology 54(10): 1674-1678. Bender, M.J. and G.D. Hartman. 2015. Bat Activity Increases with Barometric Pressure and Temperature During Autumn in Central Georgia. Southeastern Naturalist 14(2): 231-242. Benedict, R.A. 2004. Reproductive activity and distribution of bats in Nebraska. Western North American Naturalist 64(2): 231-248. Bergeson, S.M., T.C. Carter, and M.D. Whitby. 2015. Adaptive Roosting Gives Little Brown Bats an Advantage over Endangered Indiana Bats. The American Midland Naturalist 174(2):321-330. Berthinussen, A. and J. Altringham. 2012. The effect of a major road on bat activity and diversity. Journal of Applied Ecology 49(1): 82-89. Boyles, J.G. and V. Brack Jr. 2009. Modeling survival rates of hibernating mammals with individual-based models of energy expenditure. Journal of Mammalogy 90(1): 9-16. Brenner, F.J. 1974. A five-year study of a hibernating colony of Myotis lucifugus. The Ohio Journal of Science 74(4): 239-244. British Columbia Ministry of Environment, Lands, and Parks. 1998. Inventory Methods for Bats; Standards for Components of British Columbia's Biodiversity No. 20. Prepared for the Terrestrial Ecosystems Task Force Resources Inventory Committee. Version 2.0. 58 p.
Britzke, E.R., P. Sewell, M.G. Hohmann, R. Smith, S.R. Darling. 2010. Use of Temperature-sensitive Transmitters to Monitor the Temperature Profiles of Hibernating Bats Affected with White-Nose Syndrome. Northeastern Naturalist 17(2): 239-246. Broders, H.G. and G.J. Forbes. 2004. Interspecific and Intersexual Variation in Roost-Site Selection of Northern Long-eared and Little Brown Bats in the Greater Fundy National Park Ecosystem. Journal of Wildlife Management 68(3): 602-610. Broders, H.G., C.S. Findlay, and L. Zheng. 2004. Effects of Clutter on Echolocation Call Structure of Myotis septentrionalis and M. lucifugus. Journal of Mammalogy 85(2): 273-281. Broders, H.G., G.J. Forbes, S. Woodley, and I.D. Thompson. 2006. Range Extent and Stand Selection for Roosting and Foraging in Forest-Dwelling Northern Long-Eared Bats and Little Brown Bats in the Greater Fundy Ecosystem, New Brunswick. Journal of Wildlife Management 70(5): 1174-1184. Broders, H.G., L.J. Farrow, R.N. Hearn, L.M. Lawrence, and G.J. Forbes. 2014. Stable isotopes reveal that little brown bats have a broader dietary niche than northern long-eared bats. Acta Chiropterologica 16(2): 315-325. Brooks, R.T. W.M. Ford. 2005. Bat Activity in a Forest Landscape of Central Massachusetts. Northeastern Naturalist 12(4): 447-462. Brown, L.N. 1989. A longevity record for the little brown bat, Myotis lucifugus, in the western states. Southwestern Naturalist 34(2): 287. Brownlee-Bouboulis, S.A. and D.M. Reeder. 2013. White-nose Syndrome-affected Little Brown Myotis (Myotis lucifugus) Increase Grooming and Other Active Behaviors During Arousals from Hibernation. Journal of Wildlife Diseases 49(4): 850-859. Bruce, D.S. and J.E. Wiebers. 1970. Body Weight of Myotis lucifugus Under Natural and Laboratory Conditions. Journal Of Mammalogy 51(4): 823-824. Buchanan, G.D. 1985. Comments on frequency of melanism in Myotis lucifugus. Journal of Mammalogy 66(1): 178. Buchler, E.R. 1975. Food transit time in Myotis lucifugus (Chiroptera: Vespertilionidae). Journal of Mammalogy 56(1): 252-255. Buchler, E.R. 1976. Prey selection by Myotis lucifugus (Chiroptera: Vespertilionidae). American Naturalist 110(974): 619. Buchler, E.R. 1980. Evidence for the Use of a Scent Post by Myotis lucifugus. Journal of Mammalogy 61(3): 525-528. Buchler, E.R. 1980. The development of flight, foraging, and echolocation in the little brown bat (Myotis lucifugus). Behavioral Ecology and Sociobiology 6(3): 211-218. Burles, D.W., R.M. Brigham, R.A. Ring, and T.E. Reimchen. 2008. Diet of two insectivorous bats, Myotis lucifugus and Myotis keenii, in relation to arthropod abundance in a temperate Pacific Northwest rainforest environment. Canadian Journal of Zoology 86(12): 1367-1375. Burles, D.W., R.M. Brigham, R.A. Ring, and T.E. Reimchen. 2009. Influence of weather on two insectivorous bats in a temperate Pacific Northwest rainforest. Canadian Journal of Zoology 87(2): 132-138. Burnett, C.D. and T.H. Kunz. 1982. Growth Rates and Age Estimation in Eptesicus fuscus and Comparison with Myotis lucifugus. Journal of Mammalogy. 63(1): 33-41. Burns, L.E. and H.G. Broders. 2015. Maximizing mating opportunities: higher autumn swarming activity in male versus female Myotis bats. Journal of Mammalogy 96(6): 1326-1336. Burns, L.E. and H.G. Broders. 2015. Who swarms with whom? Group dynamics of Myotis bats during autumn swarming. Behavioral Ecology 26(3): 866-876. Burns, L.E., J.L. Segers, and H.G. Broders. 2015. Bat Activity and Community Composition in the Northern Boreal Forest of South-central Labrador, Canada. Northeastern Naturalist 22(1): 32-40. Burns, L.E., T.R. Frasier, and H.G. Broders. 2014. Genetic connectivity among swarming sites in the wide ranging and recently declining little brown bat (Myotis lucifugus). Ecology and Evolution 4(21): 4130-4149. Butts, T. 1997. Bat surveys Indian Creek Canyon, Elkhorn Mountains, Montana. Continental Divide Wildlife Consulting. Helena, MT 32 pg. Butts, T.W. 1993. A preliminary survey of the bats of the Deerlodge National Forest, Montana: 1991. Montana Natural Heritage Program. Helena, MT. 35 pp. Butts, T.W. 1993. A survey of the bats of the Deerlodge National Forest Montana: 1992. Montana Natural Heritage Program. Helena, MT. 39 pp. Butts, T.W. 1993. A survey of the bats of the Townsend Ranger District, Helena National Forest, Montana. Montana Natural Heritage Program. Helena, Montana. 16 pp. Butts, T.W. 1993. Azure Cave bat surveys, Little Rocky Mountains, Montana, September 1992 and March 1993. Unpublished report for Zortman Mining, Inc. 13 pp. Cagle, F.R. and L. Cockrum. 1943. Notes on a summer colony of Myotis lucifugus lucifugus. Journal of Mammalogy 24(4): 474-492. Callahan, E.V. and R.D. Drobney. 1997. Selection of summer roosting sites by Indiana bats (Myotis sodalis) in Missouri. Journal of Mammalogy 78(3): 818. Carlson, J.C. and P. Hendricks. 2001. A Proposal for: Bat Use of Highway Structures: A Pilot Study. Submitted to the Montana Department of Transportation. Carlson, J.C. and S.V. Cooper. 2003. Plant and Animal Resources and Ecological Condition of the Forks Ranch Unit of the Padlock Ranch, Big Horn County, Montana and Sheridan County, Wyoming. Unpublished report to The Nature Conservancy Montana Field Office. Carraway, L.N. 2009. Comments on Field Identification of Myotis yumanensis and Myotis lucifugus: a morphological evaluation. Western North American Naturalist 69(2): 277-278. Chester, J.M., N.P. Campbell, K. Karsmizki, and D. Wirtz. 1979. Resource inventory and evaluation. Azure Cave, Montana. BLM unpublished report. 55 pp. Choate, J. R. and J. M. Anderson. 1997. Bats of Jewel Cave National Monument, South Dakota. Prairie Naturalist 29:39-47. Christy, R. E. and S. W. West. 1993. Biology of bats in Douglas-fir forests. U.S.D.A., Forest Serv., Pac. Northw. res. Station, Gen. Tech. Rep. PNW-GTR-308. Chung-MacCoubrey, A.L. 2005. Use of pinyon–juniper woodlands by bats in New Mexico. Forest Ecology and Management 204: 209–220. Clare, E.L., B.R. Barber, B.W. Sweeney, P.N. Hebert, and M.B. Fenton. 2011. Eating local: influences of habitat on the diet of little brown bats ( Myotis lucifugus). Molecular Ecology 20(8): 1772-1780. Clare, E.L., W.C. Symondson, H. Broders, F. Fabianek, E.E. Fraser, A. MacKenzie, A. Boughen, R. Hamilton, C.K. Willis, F. Martinez-Nuñez, A.K. Menzies, K.J.O. Norquay, M. Brigham, J. Poissant, J. Rintoul, R.M.R. Barclay, and J.P. Reimer. 2014. The diet of Myotis lucifugus across Canada: assessing foraging quality and diet variability. Molecular Ecology 23(15): 3618-3632. Clement, M.J., J.M. O'Keefe, and B. Walters. 2015. A method for estimating abundance of mobile populations using telemetry and counts of unmarked animals. Ecosphere 6(10): 184. Clement, M.J., T.J. Rodhouse, P.C. Ormsbee, J.M. Szewczak, and J.D. Nichols. 2014. Accounting for false-positive acoustic detections of bats using occupancy models. Journal of Applied Ecology 51(5): 1460-1467. Cockrum, E.L., B. Musgrove, and Y. Peteryszyn. 1996. Bats of Mohave County, Arizona: populations and movements. Occasional Papers of The Museum, Texas Tech University 157: 1-71. Coleman, J.L. and R.R. Barclay. 2013. Prey availability and foraging activity of grassland bats in relation to urbanization. Journal of Mammalogy 94(5): 1111-1122. Coleman, L.S., W.M. Ford, C.A. Dobony, and E.R. Britzke. 2014. A Comparison of Passive and Active Acoustic Sampling for a Bat Community Impacted by White-Nose Syndrome. Journal of Fish and Wildlife Management 5(2): 217-226. Coleman, L.S., W.M. Ford, C.A. Dobony, and E.R. Britzke. 2014. Comparison of Radio-telemetric Home-Range Analysis and Acoustic Detection for Little Brown Bat Habitat Evaluation. Northeastern Naturalist 21(3): 431-445. Corbett, J. 2011. Evaluation and management of select natural cave and abandoned mine features of the Lewis and Clark and Helena National Forests, Montana. Bat Conservation International. 18pp plus appendices. Crampton, L. H., and R. M. Barclay. 1998. Selection of roosting and foraging habitat by bats in differentaged quaking aspen mixedwood stands. Conservation Biology 12:1347-1358. Cryan, P. M., M. A. Bogan, and J. S. Altenbach. 2000. Effect of elevation on distribution of female bats in the Black Hills, South Dakota. Journal of Mammalogy 81:719-725. Cvikel, N., E. Levin, E. Hurme, I. Borissov, A. Boonman, E. Amichai, and Y. Yovel. 2015. On-board recordings reveal no jamming avoidance in wild bats. Proceedings of the Royal Society B: Biological Sciences, The Royal Society 282(1798). Czenze, Z., A. Park, and C.K. Willis. 2013. Staying cold through dinner: cold-climate bats rewarm with conspecifics but not sunset during hibernation. Journal of Comparative Physiology B: Biochemical, Systemic and Environmental Physiology 183(6): 859-866. Czenze, Z.J. and C.K. Willis. 2015. Warming up and shipping out: arousal and emergence timing in hibernating little brown bats (Myotis lucifugus). Journal of Comparative Physiology B 185(5): 575-586. Davis, R. 1966. Homing performance and homing ability in bats. Ecological Monographs 36(3): 201-237. Davis, W.B. 1937. Some mammals from western Montana and eastern Idaho. The Murrelet 18(2): 22-27. Davis, W.H. 1964. Winter awakening patterns in the bats Myotis lucifugus and Pipistrellus subflavus. Journal of Mammalogy 45(4): 645-647. Davis, W.H., M.D. Hassell, and M.J. Harvey. 1965. Maternity colonies of the bat Myotis l. lucifugus in Kentucky. American Midland Naturalist 73(1): 161-165. Davy, C.M. and E.E. Fraser. 2007. Observation of Foliage-roosting in the Little Brown Bat, Myotis lucifugus. Canadian Field-Naturalist 121(4): 420. Davy, C.M., F. Martinez-Nunez, K.C. Willis, and S.V. Good. 2015. Spatial genetic structure among bat hibernacula along the leading edge of a rapidly spreading pathogen. Conservation Genetics 16(5): 1013-1024. Department of Health and Environmental Sciences Food and Consumer Safety Bureau. 1981. Montana Bats Part I: Control. Vector Control Bulletin Number 2. 6 p.
Department of Health and Environmental Sciences Food and Consumer Safety Bureau. 1981. Montana Bats Part II: Identification and Biology. Vector Control Bulletin Number 2A. 10 p.
Dixon, M.D. 2011. Population genetic structure and natal philopatry in the widespread North American bat Myotis lucifugus. Journal of Mammalogy 92(6): 1343-1351. Dubois, K. 1999. Region 4 bat surveys: 1998 progress report. Unpublished report, Montana Fish, Wildlife & Parks Region 4 Headquarters, Great Falls, Montana. 20 pp. DuBois, K. 2000. Species occurrence and Distribution of Bats in North Central Montana: Range Map Changes Resulting from Two Years of Field Surveys. Intermountain Journal of Sciences 6(4): 376. Ducummon, S.L. 1997. The North American bats and mines project: a cooperative approach for integrating bat conservation and mine-land reclamation. Paper presented at the 1997 National Meeting of the American Society for Mining and Reclamation, Austin, Texas. Dzal, Y. and R. Brigham. 2013. The tradeoff between torpor use and reproduction in little brown bats ( Myotis lucifugus). Journal of Comparative Physiology B: Biochemical, Systemic & Environmental Physiology 183(2): 279-288. Dzal, Y., L.P. McGuire, N. Veselka, and M.B. Fenton. 2011. Going, going, gone: the impact of white-nose syndrome on the summer activity of the little brown bat (Myotis lucifugus). Biology Letters 7(3): 392-394. Easterla, D. A. 1973. Ecology of the 18 species of Chiroptera at Big Bend National Park, Texas. Part I and II. Northwest Missouri State University Studies 34:1-165. Ehlman, S.M., J.J. Cox, and P.H. Crowley. 2013. Evaporative water loss, spatial distributions, and survival in white-nose-syndrome-affected little brown myotis: a model. Journal Of Mammalogy 94(3): 572-583. Ethier, K. and L. Fahrig. 2011. Positive effects of forest fragmentation, independent of forest amount, on bat abundance in eastern Ontario, Canada. Landscape Ecology 26(6): 865-876. Feigley, H.P. 1998. An Examination of the Issues and Feasibility of Conducting Surveys of Abandoned Mines for Bats. Montana Natural Heritage Program, Helena, MT. 12 p.
Feigley, H.P., M. Brown, S. Martinez, and K. Schletz. 1997.Assessment of mines for importance to bat species of concern, southwestern Montana. Report to: U.S. Geological Survey, Biological Resources Division, Midcontinent Ecological Science Center; 4512 McMurry Ave., Fort Collins, CO 80525-3400. 9pp. Feldhamer, G.A., T.C. Carter, and J.O. Whitaker Jr. 2009. Prey Consumed by Eight Species of Insectivorous Bats from Southern Illinois. American Midland Naturalist 162(1): 43-51. Fenton, M. B., H. G Merriam, and G L. Holroyd. 1983. Bats of Kootenay, Glacier, and Mount Revelstoke national parks in Canada: identification by echolocation calls, distribution, and biology. Canadian Journal of Zoology 61 :2503-2508. Fenton, M.B. 1969. Summer activity of Myotis lucifugus (Chiroptera: Vespertilionidae) at hibernacula in Ontario and Quebec. Canadian Journal of Zoology 47: 597-602. Fenton, M.B. 1977. 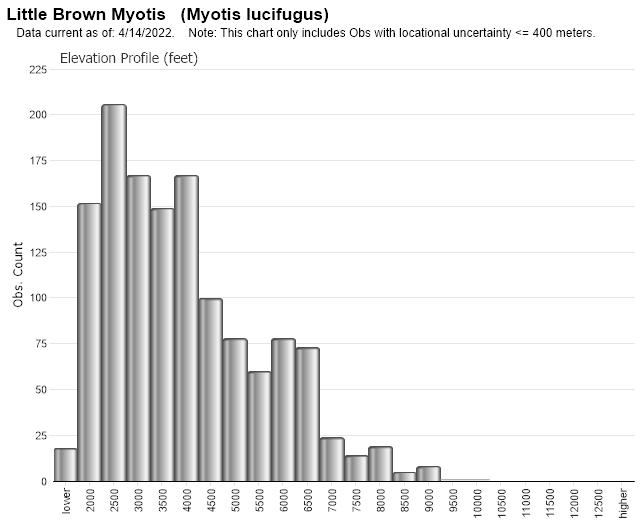 Variation in the social calls of little brown bats (Myotis lucifugus). Canadian Journal of Zoology 55(7): 1151-1157. Fenton, M.B. 1990. The Foraging Behavior and Ecology of Animal-Eating Bats. Canadian Journal of Zoology 68(3): 411-422. Fenton, M.B. 2003. Science and the conservation of bats: where to next? Wildlife Society Bulletin 31(1) 6-15. Fenton, M.B. and R.M. Barclay. 1980. Myotis lucifugus . Mammalian Species No. 142. 8 pp. Fenton, M.B., J.J. Belwood, J.H. Fullard, and T.H. Kunz. 1976. Responses of Myotis lucifugus (Chiroptera: Vespertilionidae) to calls of conspecifics and to other sounds. Canadian Journal of Zoology 54(9): 1443-1448. Fenton, M.B., M.D. Skowronski, L.P. McGuire, and P.A. Faure. 2011. Variation in the use of harmonics in the calls of laryngeally echolocating bats. Acta Chiropterologica 13(1): 169-178. Field K.A., J.S. Johnson, T.M. Lilley, S.M. Reeder, E.J. Rogers, M.J. Behr, and D.M. Reeder. 2015. The White-Nose Syndrome Transcriptome: Activation of Anti-fungal Host Responses in Wing Tissue of Hibernating Little Brown Myotis. PLoS Pathog 11(10): e1005168. Ford, W.M., E.R. Britzke, C.A. Dobony, J.L. Rodrigue, and L.B. Johnson. 2011. Patterns of Acoustical Activity of Bats Prior to and Following White-Nose Syndrome Occurrence. Journal of Fish and Wildlife Management 2(2): 125-134. Ford, W.M., M.A. Menzel, J.L. Rodrigue, J.M. Menzel, and J.B. Johnson. 2005. Relating bat species presence to simple habitat measures in a central Appalachian forest. Biological Conservation 126(4): 528-539. Frick, W.F., D.S. Reynolds, and T.H. Kunz. 2010. Influence of climate and reproductive timing on demography of little brown myotis, Myotis lucifugus. Journal of Animal Ecology 79(1): 128-136. Frick, W.F., J.F. Pollock, A.C. Hicks, K.E. Langwig, D.S. Reynolds, G.G. Turner, C.M. Butchkoski, and T.H. Kunz. 2010. An Emerging Disease Causes Regional Population Collapse of a Common North American Bat Species. Science 329(5992): 679-682. Fuller, N., J. Reichard, M. Nabhan, S. Fellows, L. Pepin, and T. Kunz. 2011. Free-Ranging Little Brown Myotis (Myotis lucifugus) Heal from Wing Damage Associated with White-Nose Syndrome. Ecohealth 8(2): 154-162. Gallant, A.J. and H.G. Broders. 2015. Body condition explains little of the interindividual variation in the swarming behaviour of adult male little brown myotis (Myotis lucifugus) in Nova Scotia, Canada. Canadian Journal of Zoology 93(6): 469-476. Genoways, H. H., and J. K. Jones, Jr. 1972. Mammals from southwestern North Dakota. Occasional Papers, The Museum, Texas Tech University 6:1-36. Genter, D. L. 1986. Wintering bats of the upper Snake River plain: occurrence in lava-tube caves. Great Basin Naturalist 46(2):241-244. Genter, D.L. and K.A. Jurist. 1995. Bats of Montana. Guide for Assessing Mines for Bats Workshop, June 14-15, 1995, Helena, MT, hosted by Montana Department of State Lands and the Abandoned Mine Reclamation Bureau. Montana Natural Heritage Program. 11 pp. Golden Sunlight Mines, Inc. 2000. Golden Sunlight Mines, Inc., Whitehall, MT. Annual Permit Reports. Grinnell, A.D. and D.R. Griffin. 1958. The sensitivity of echolocation in bats. Biological Bulletin 114(1): 10-22. Griscom, H.R. and D.A. Keinath. 2011. Inventory and status of bats at Devils Tower National Monument. Report prepared for the USDI National Park Service by the Wyoming Natural Diversity Database. University of Wyoming, Laramie, Wyoming. Griscom, H.R., M.D. Anderson, and D.A. Keinath. 2012. Bats of southern Wyoming: distribution and migration, year 1 report. Prepared for the USDI Bureau of Land Management by the Wyoming Natural Diversity Database. University of Wyoming, Laramie, Wyoming. Gummer, D.L. and R.M. Brigham. 1995. Does fluctuating asymmetry reflect the importance of traits in little brown bats (Myotis lucifugus)? Canadian Journal of Zoology 73(5): 990-992. Hagen, E.M. and J.L. Sabo. 2011. A landscape perspective on bat foraging along rivers: does channel confinement and insect availability influence the response of bats to aquatic resources in riverine landscapes? Oecologia 166(3): 751-760. Hanauska-Brown, L., B.A. Maxell, A. Petersen, and S. Story. 2014. Diversity Monitoring in Montana 2008 – 2010 Final Report. Montana Fish, Wildlife & Parks. Helena, MT. 78 pp. Harmata, A., D. Flath, R. Hazlewood, and S. Milodragovich. 2002. Initial Site Evaluation for Wind Resource Development in Montana: An Index Relative to Potential Impacts on Vertebrate Wildlife. Intermountain Journal of Sciences 8(4): 253-254. Harris, A.H. 1974. Myotis yumanensis in interior southwestern North America with comments on Myotis lucifugus. Journal of Mammalogy. 55:589-607. Hein, C.D., S.B. Castleberry, and K.V. Miller. 2009. Site-occupancy of bats in relation to forested corridors. Forest Ecology and Management 257(4): 1200-1207. Hendricks, P. 2000. Preliminary bat inventory of caves and abandoned mines on BLM lands, Judith Mountains, Montana. Montana Natural Heritage Program, Helena, Montana. 21 pp. Hendricks, P. 1997. Mine assessments for bat activity, Garnet Resource Area, BLM: 1997. Unpublished report to USDI, Bureau of Land Management. 17pp. Hendricks, P. 1998. Bats surveys of Azure Cave and the Little Rocky Mountains: 1997-1998. November 1998. Hendricks, P. 1999. Effect of gate installation on continued use by bats of four abandoned mine workings in western Montana. Unpublished report to Montana Department of Environmental Quality. Montana Natural Heritage Program, Helena, Montana. 13 pp. Hendricks, P. 1999. Mine Assessment for Bat Activity, Helena National Forest: 1999. Montana Natural Heritage Program. Helena, MT. 12 pp. Hendricks, P. 2000. Assessment of abandoned mines for bat use on Bureau of Land Management lands in the Philipsburg, Montana area: 1999. Montana Natural Heritage Program, Helena, MT.13pp. Hendricks, P. 2000. Bat survey along the Norris-Madison Junction Road corridor, Yellowstone National Park, Wyoming, 1999. Montana Natural Heritage Program, Helena, MT. 15pp. Hendricks, P. 2003. Assessment of Selected Mines for Use by Bats in the Garnet and Avon Areas: 2002. Montana Natural Heritage Program. Helena, MT. 12 p.
Hendricks, P. and B.A. Maxell. 2005. Bat Surveys on USFS Northern Region Lands in Montana: 2005. Report to the USDA Forest Service, Northern Region. Montana Natural Heritage Program, Helena, MT. 12 pp. plus appendices. Hendricks, P. and D. Kampwerth. 2001. Roost environments for bats using abandoned mines in southwestern Montana : a preliminary assessment. Report to the U.S. Bureau of Land Management. Montana Natural Heritage Program, Helena, Montana. 19 pp. Hendricks, P. and D.L. Genter. 1997. Bat surveys of Azure Cave and the Little Rocky Mountains: 1996. Montana Natural Heritage Program. Helena, MT. 25 pp. Hendricks, P. and J.C. Carlson. 2001. Bat use of abandoned mines in the Pryor Mountains. Report to the Montana Department of Environmental Quality, Mine Waste Cleanup Bureau. Montana Natural Heritage Program. Helena, Montana. 8 pp. Hendricks, P. and L.M. Hendricks. 2010. Water Aquistion During Daylight by Free-Ranging Myotis Bats. Northwestern Naturalist 91(3): 336-338. Hendricks, P., B.A. Maxell, S. Lenard, C. Currier and J. Johnson. 2006. Riparian Bat Surveys in Eastern Montana. A report to the USDI Bureau of Land Management, Montana State Office. Montana Natural Heritage Program, Helena, Montana. 13 pp. plus appendices. Hendricks, P., C. Currier, and J. Carlson. 2004. Bats of the BLM Billings Field Office in south-central Montana, with emphasis on the Pryor Mountains. Report to Bureau of Land Management Billings Field Office. Montana Natural Heritage Program, Helena, MT. 19 pp. + appendices. Hendricks, P., D. Kampwerth and M. Brown. 1999. Assessment of abandoned mines for bat use on Bureau of Land Management lands in southwestern Montana: 1997-1998. Montana Natural Heritage Program, Helena. 29 pp. Hendricks, P., D. L. Genter, and S. Martinez. 2000. Bats of Azure Cave and the Little Rocky Mountains, Montana. Canadian Field-Naturalist 114 :89-97. Hendricks, P., K. Jurist, D.L. Genter, and J.D. Reichel. 1995. Bat survey of the Sioux District, Custer National Forest: 1994. Montana Natural Heritage Program. Helena, Montana. 41 pp. Hendricks, P., K.A. Jurist, D.L. Genter and J.D. Reichel. 1996. Bats of the Kootenai National Forest, Montana. Unpublished report. Montana Natural Heritage Program, Helena, Montana. 99 pp. Hendricks, P., K.A. Jurist, D.L. Genter, and J.D. Reichel. 1995. Bat survey of the Kootenai National Forest, Montana: 1994. MTNHP report. Hendricks, P., S. Lenard, C. Currier and J. Johnson. 2005. Bat Use of Highway Bridges in South-Central Montana. FHWA/MT-05-007/8159. Final Report prepared for the Montana Department of Transportation, in cooperation with the U.S. Department of Transportation Federal Highway Administration, prepared by the Montana Natural Heritage Program. Hendricks, P., S. Lenard, C. Currier, and B.A. Maxell. 2007. Filling the distribution gaps for small mammals in Montana. Helena, MT. : Montana Natural Heritage Program. Hendricks, Paul. 2012. 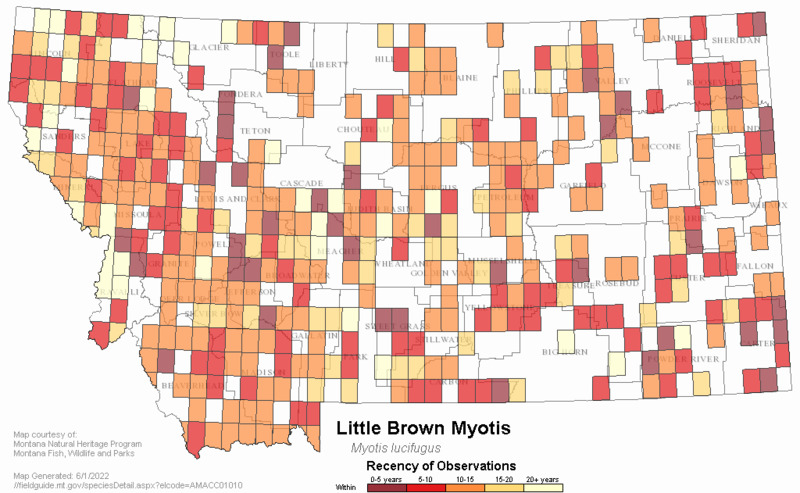 Winter Records of Bats in Montana. Northwestern Naturalist. 93:154-162. Henry, M., D.W. Thomas, R. Vaudry, and M. Carrier. 2002. Foraging distances and home range of pregnant and lactating little brown bats (Myotis lucifugus). Journal of Mammalogy 83(3): 767-774. Herd, R.M. and M.B. Fenton. 1983. An electrophoretic, morphological, and ecological investigation of a putative hybrid zone between Myotis lucifugus and Myotis yumanensis (Chiroptera: Vespertilionidae). Canadian Journal of Zoology 61:2029-2050. Hernández, D.L., J.J. Mell, and M.D. Eaton. 2007. Aerial Predation of a Bat by an American Crow. Wilson Journal of Ornithology 119(4): 763-764. Hill J.E. and J.D. Smith: 1984. Bats: a natural history. Univ. Texas Press Austin. 243 pp. Hinman, K.E. and T.K. Snow, eds. 2003. Arizona Bat Conservation Strategic Plan. Nongame and Endangered Wildlife Program Technical Report 213. Arizona Game and Fish Department, Phoenix, Arizona. Hitchcock, H. B. 1949. Hibernation of bats in southeastern Ontario and adjacent Quebec. The Canadian Field Naturalist 63(2):47-59. Hitchcock, H.B. 1965. Twenty-three years of bat banding in Ontario and Quebec. Canadian Field-Naturalist 79: 4-14. Hoffmann, R. S., D. L. Pattie and J. F. Bell. 1969. 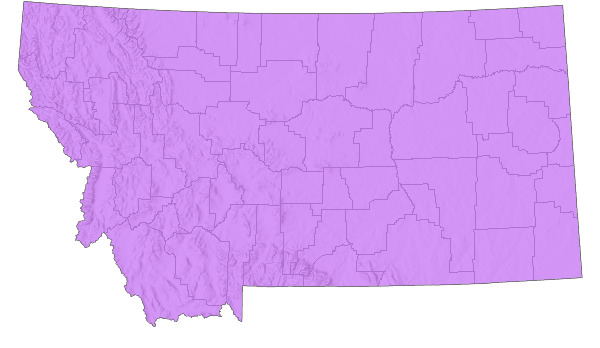 The distribution of some mammals in Montana. II. Bats. Journal of Mammalogy 50(4): 737-741. Hogberg, L.K., K.J. Patriquin, and R.M.R. Barclay. 2002. Use by bats of patches of residual trees in logged areas of the boreal forest. American Midland Naturalist 148(2): 282-288. Holroyd, S.L., V.J. Craig, and P. Govindarajulu. 2016. Best Management Practices for Bats in British Columbia. Ministry of Environment, Victoria, BC. 301pp. Hooper, S.E. and S.K. Amelon. 2014. Handling and blood collection in the little brown bat (Myotis lucifugus). Lab Animal 43(6): 197-199. Humphrey, S. R. 1975. Nursery roosts and community diversity of Nearctic bats. Journal of Mammalogy 56:321-346. Humphrey, S.R. and J.B. Cope. 1976. Population ecology of the little brown bat, Myotis lucifugus, in Indiana and north-central Kentucky. American Society Mammalogists Special Publication (4):1-81. Hurst, R.N. and J.E. Wiebers. 1967. Minimum body temperature extremes in the little brown bat, Myotis lucifugus. Journal of Mammalogy 48(3): 465-465. Huynh, H.M. 2009. Another Record of Foliage Roosting in the Little Brown Bat, Myotis lucifugus, in Canada. Canadian Field-Naturalist 123(3): 265. Jachowski, D.S., C.A. Dobony, L.S. Coleman, W.M. Ford, E.R. Britzke, and J.L. Rodrigue. 2014. Disease and community structure: white-nose syndrome alters spatial and temporal niche partitioning in sympatric bat species. Diversity and Distributions 20(9): 1002-1015. Jameson, J.W. and J.F. Hare. 2009. Group-specific signatures in the echolocation calls of female little brown bats (Myotis Incifugus) are not an artefact of clutter at the roost entrance. Acta Chiropterologica 11(1): 163-172. Janicki, A.F., W.F. Frick, A.M. Kilpatrick, K.L. Parise, J.T. Foster, and G.F. McCracken. 2015. Efficacy of Visual Surveys for White-Nose Syndrome at Bat Hibernacula. PLoS ONE 10(7): e0133390. Jantzen, M., and M. Fenton. 2013. The depth of edge influence among insectivorous bats at forest-field interfaces. Canadian Journal of Zoology 91(5): 287-292. Jiang, T., H. Wu, J. Feng. 2015. Patterns and causes of geographic variation in bat echolocation pulses. Integrative Zoology 10(3): 241-256. Johnson J.S., D.M. Reeder, J.W. McMichael III, M.B. Meierhofer, D.W.F. Stern, S.S. Lumadue, L.E. Sigler, H.D. Winters, M.E. Vodzak, A. Kurta, and J.A. Kath. 2014. Host, Pathogen, and Environmental Characteristics Predict White-Nose Syndrome Mortality in Captive Little Brown Myotis (Myotis lucifugus). PLoS ONE 9(11): e112502. Johnson, J.B., P.B. Wood, and J.W. Edwards. 2006. Are External Mine Entrance Characteristics Related to Bat Use? Wildlife Society Bulletin 34(5): 1368-1375. Johnson, L.N., B.A. McLeod, L.E. Burns, K. Arseneault, T.R. Frasier, and H.G. Broders. 2015. Population Genetic Structure Within and among Seasonal Site Types in the Little Brown Bat (Myotis lucifugus) and the Northern Long-Eared Bat (M. septentrionalis). PLoS ONE 10(7): e0133457. Jonasson, K.A. and C.R. Willis. 2012. Hibernation energetics of free-ranging little brown bats. Journal of Experimental Biology 215(12): 2141-2149. Jones, J.K., Jr., R.P. Lampe, C.A. Spenrath, and T.H. Kunz. 1973. Notes on the distribution and natural history of bats in southeastern Montana. Occasional papers (Texas Tech University Museum) 15:1-11. Jung, T.S. and B.G. Slough. 2005. Mortality of little brown bats, Myotis lucifugus, in a rodent trap in the boreal forest. Canadian Field-Naturalist 119(4): 589-590. Jung, T.S., I.D. Thompson, and R.D. Titman. 2004. Roost site selection by forest-dwelling male Myotis in central Ontario, Canada. Forest Ecology and Management 202(1-3): 325-335. Kalcounis, M. C., K. A. Hobson, R. M. Brigham, and K. R. Hecker. 1999. Bat activity in the boreal forest: importance of stand type and vertical strata. Journal of Mammalogy 80:673- 682. Kalcounis, M.C. and R.M. Brigham. 1994. Impact of predation risk on emergence by little brown bats, Myotis lucifugus (Chiroptera: Vespertilionidae), from a maternity colony. Ethology 98(3/4): 201-209. Kalcounis, M.C. and R.M. Brigham. 1995. Intraspecific variation in wing loading affects habitat use by little brown bats (Myotis lucifugus). Canadian Journal of Zoology 73(1): 89-95. Kazial, K.A., S. Pacheco, and K.N. Zielinski. 2008. Information content of sonar calls of little brown bats (Myotis lucifugus): Potential for communication. Journal of Mammalogy 89(1): 25-33. Kazial, K.A., T.L. Kenny, and S.C. Burnett. 2008. Little Brown Bats ( Myotis lucifugus) Recognize Individual Identity of Conspecifics Using Sonar Calls. Ethology 114(5): 469-478. Keeley, B. W., and M. D. Tuttle. 1999. “Bats in American Bridges.” Resource Publication No. 4. Bat Conservation International. Austin, TX. 41 p.
Keen, R., and H. B. Hitchcock. 1980. Survival and longevity of the little brown bat in southeastern Ontario. Journal of Mammalogy 61:1-7. Keinath, D. 2004. Bat and Terrestrial Mammal Inventories in the Greater Yellowstone Network: A progress report. Wyoming Natural Diversity Database, Laramie, WY. 17 pp. Keinath, D. 2005. Supplementary Mammal Inventory of Bighorn Canyon National Recreation Area. Final Report. Wyoming Natural Diversity Database, Laramie, WY. 21 pp. Keinath, D.A. 2001. Bat Habitat Delineation and Survey Suggestions for Bighorn Canyon National Recreation Area. Unpublished report prepared by the Wyoming Natural Diversity Database for the North American Bat Conservation Partnership. Keinath, D.A. 2005. A bat Conservation Evaluation for White Grass Ranch, Grand Teton National Park, Wyoming. Unpublished report for Grand Teton National Park by the Wyoming Natural Diversity Data Base, Laramie, WY. Keinath, D.A. 2007. Yellowstone's World of Bats: Taking Inventory of Yellowstone's Night Life. Yellowstone Science 15: 3-13. Keinath, Douglas A. 2005. Bat inventory of the Greater Yellowstone Network: Final Report. National Park Service Greater Yellowstone Network Inventory and Monitoring Program (hardcopy). Kingston, T., G. Jones, Z. Akbar, and T.H. Kunz. 2003. Alternation of echolocation calls in 5 species of aerial-feeding insectivorous bats from Malaysia. Journal of Mammalogy 84(1): 205-215. Krochmal, A.R. and D.W. Sparks. 2007. Timing of Birth and Estimation of Age of Juvenile Myotis septentrionalis and Myotis lucifugus in West-central Indiana. Journal of Mammalogy 88(3): 649-656. Kubista, C.E. and A. Bruckner. 2015. Importance of urban trees and buildings as daytime roosts for bats. Biologia 70(11): 1545-1552. Kudray, G.M., P. Hendricks, E. Crowe, and S.V. Cooper. 2004. Riparian forests of the Wild and Scenic Missouri River: ecology and management. Prepared for Lewistown Field Office, Bureau of Land Management, Lewistown, Montana. Montana Natural Heritage Program, Helena, MT. 29 pp. plus appendices. Kunz, T. H. (ed). 1988. Ecological and behavioral methods for the study of bats. Smithsonian Inst., Washington D.C., 533 pp. Kunz, T. H. and J.D. Reichard. 2011. Status Review of the Little Brown Myotis (Myotis lucifugus) and Determination that Immediate Listing Under the Endangered Species Act is Scientifically and Legally Warranted. Boston, MA: Boston University. 31 p.
Kunz, T.H. and E.L.P. Anthony. 1982. Age Estimation and Post-Natal Growth in the Bat Myotis lucifugus. Journal of Mammalogy 63(1): 23-32. Kunz, T.H. and M.B. Fenton. 2003. Bat Ecology. Chicago, Ill: University of Chicago Press. p. 1-745. Kunz, T.H. and P.A. Racey. 1998. Bat biology and conservation. International Bat Research Conference 1995. Boston University. Smithsonian Institution Press. Kurta, A. 1982. Flight Patterns of Eptesicus fuscus and Myotis lucifugus Over a Stream. Journal of Mammalogy 63(2): 335-337. Kurta, A. 1985. External insulation available to a non-nesting mammal, the little brown bat (Myotis lucifugus). Comparative Biochemistry and Physiology. Part A: Comparative Physiology 82(2): 413-420. Kurta, A. 1986. Factors affecting the resting and postflight body temperature of little brown bats, Myotis lucifugus. Physiological Zoology 59(4): 429-438. Kurta, A. 1991. Torpor patterns in food-deprived Myotis lucifugus (Chiroptera: Vespertilionidae) under simulated roost conditions. Canadian Journal of Zoology 69(1): 255-257. Kurta, A. and G.G. Kwiecinski. 2007. The square-eared anomaly in New World Myotis. Acta Chiropterologica 9(2): 495-501. Kurta, A. and S.M. Smith. 2014. Hibernating Bats and Abandoned Mines in the Upper Peninsula of Michigan. Northeastern Naturalist 21(4): 587-605. Kurta, A. and T.H. Kunz. 1988. Roosting metabolic rate and body temperature of male little brown bats (Myotis lucifugus) in summer. Journal of Mammalogy 69(3): 645-651. Kurta, A., G.P. Bell, K.A. Nagy, and T.H. Kunz. 1989. Energetics of pregnancy and lactation in free-ranging little brown bats (Myotis lucifugus). Physiological Zoology 62(3): 804-818. Kurta, A., G.P. Bell, K.A. Nagy, and T.H. Kunz. 1989. Water balance of free-ranging little brown bats (Myotis lucifugus) during pregnancy and lactation. Canadian Journal of Zoology 67(10): 2468-2472. Lacki, M.J., L.E. Dodd, R.S. Toomey, S.C. Thomas, Z.L. Couch, and B.S. Nicholas. 2015. Temporal Changes in Body Mass and Body Condition of Cave-Hibernating Bats During Staging and Swarming. Journal of Fish and Wildlife Management 6(2): 360-370. LaMarr, S. and A.J. Kuenzi. 2011. 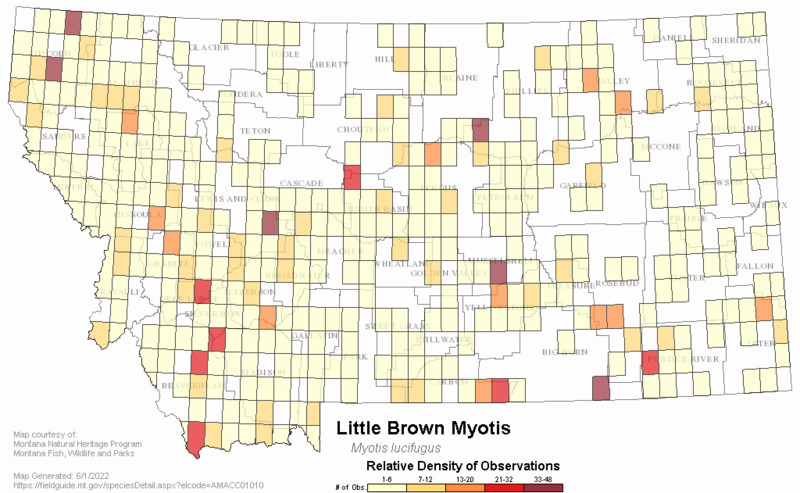 Bat species presence in southwestern Montana. Intermountain Journal of Sciences. 17:1-4. Pp 14-19. Lampe, R.P., J.K. Jones Jr., R.S. Hoffmann, and E.C. Birney. 1974. The mammals of Carter County, southeastern Montana. Occa. Pap. Mus. Nat. Hist. Univ. Kan. 25:1-39. Lausen, C. 2005. First record of hosts for tick Carios kelleyi (Acari: Ixodida: Argasidae) in Canada and Montana. Journal of Medical Entomology 42(3): 497-501. Lee, Y. and G.F. McCracken. 2004. Flight activity and food habits of three species of Myotis bats (Chiroptera: Vespertilionidae) in sympatry. Zoological Studies 43(3): 589-597. Leffler, J.W., L.T. Leffler, and J.S. Hall. 1979. Effects of familiar area on the homing ability of the little brown bat, Myotis lucifugus. Journal of Mammalogy 60(1): 210-204. Lemke, T. 1991. Big Sky UFOs. Montana Outdoors 22(6):2-7. Lenard, S. and P. Hendricks. 2012. Bat Surveys at Army Corps of Engineers Libby Dam, Libby, Montana 2011. A report to the US Army Corps of Engineers, Libby Dam. Montana Natural Heritage Program, Helena, MT. 21 pp. Lenard, S., B.A. Maxell, P. Hendricks, and C. Currier. 2007. Bat Surveys on USFS Northern Region 1 Lands in Montana: 2006. Report to the USDA Forest Service, Northern Region. Montana Natural Heritage Program, Helena, Montana. 23 pp. plus appendices. Lenard, S., P. Hendricks, and B.A. Maxell. 2009. Bat surveys on USFS Northern Region lands in Montana: 2007. A report to the USDA Forest Service, Northern Region. Helena, MT. Montana Natural Heritage Program. 21 pp plus appendices. Lewis, S. E. 1995. “Roost Fidelity of Bats: a Review.” Journal of Mammalogy 76:481-496. Lilley, T.M., J.S. Johnson, L. Ruokolainen, E.J. Rogers, C.A. Wilson, S.M. Schell, K.A. Field, and D.M. Reeder. 2016. White-nose syndrome survivors do not exhibit frequent arousals associated with Pseudogymnoascus destructans infection. Frontiers in Zoology 13(1): 1. Litvaitis, J.A. 2001. Importance of early successional habitats to mammals in eastern forests. Wildlife Society Bulletin 29(2): 466-473. Lorch, J.M., C.U. Meteyer, M.J. Behr, J.G. Boyles, P.M. Cryan, A.C. Hicks, A.E. Ballmann, J.T. Coleman, D.N. Redell, D.M. Reeder, and D.S. Blehert. 2011. Experimental infection of bats with Geomyces destructans causes white-nose syndrome. Nature 480(7377): 376-378. Lunde, Robert E. and A. S. Harestad. 1986. Activity of little brown bats in coastal forests. Northwest Science 60(4):204-207. Luszcz T.M., J.M. Rip, K.J. Patriquin, L.M. Hollis, J.M. Wilson, H.D. Clarke, J. Zinck, and R.M. Barclay. 2016. A Blind-Test Comparison of the Reliability of Using External Morphology and Echolocation-Call Structure to Differentiate Between the Little Brown Bat (Myotis lucifugus) and Yuma Myotis (Myotis yumanensis). Northwestern Naturalist 97(1): 13-23. Madson. M. 1990. Tate-Potter Cave. Unpublished report, with maps. 6 pp. Martin, K.A. and M.B. Fenton. 1978. A possible defensive function for calls given by bats (Myotis lucifugus) arousing from torpor. Canadian Journal of Zoology 56(6): 1430-1432. Martinez, S. 1999. Evaluation of selected bat habitat sites along the Mammoth-Norris grand loop road corridor, Yellowstone National Park, Wyoming, 1997-1998. [Unpublished report submitted to the Montana Natural Heritage Program, Helena, MT]. 16pp. Maslo, B. and N.H. Fefferman. 2015. A case study of bats and white-nose syndrome demonstrating how to model population viability with evolutionary effects. Conservation Biology 29(4): 1176-1185. Maslo, B., M. Valent, J.F. Gumbs, and W.F. Frick. 2015. Conservation implications of ameliorating survival of little brown bats with white-nose syndrome. Ecological Applications 25(7): 1832-1840. Masterson, F.A. and S.R. Ellins. 1974. The role of vision in the orientation of the echolocating bat, Myotis lucifugus. Behaviour 51(1): 88-98. Matheson, A.L., K.L. Campbell, and C.K.R. Willis. 2010. Feasting, fasting and freezing: energetic effects of meal size and temperature on torpor expression by little brown bats Myotis lucifugus. Journal of Experimental Biology 213(12): 2165-2173. Mathews, F., N. Roche, T. Aughney, N. Jones, J. Day, J. Baker, and S. Langton. 2015. Barriers and benefits: implications of artificial night-lighting for the distribution of common bats in Britain and Ireland. Philosophical Transactions of the Royal Society B: Biological Sciences 370(1667): 20140124. Matthews, W. L., and J. E. Swenson. 1982. The mammals of east-central Montana. Proc. Mont. Acad. Sci. 41:1-13. McAlpine, D.F., K.J. Vanderwolf, G.J. Forbes, and D. Malloch. 2011. Consumption of Bats (Myotis spp.) by Raccoons (Procyon lotor) During an Outbreak of White-Nose Syndrome in New Brunswick, Canada: Implications for Estimates of Bat Mortality. Canadian Field-Naturalist 125(3): 257-260. McGee, M., D.A. Keinath and G.P. Beauvais. 2002. Survey for rare vertebrates in the Pinedale Field Office of the USDI Bureau of Land Management (Wyoming). Unpublished report prepared for USDI Bureau of Land Management. Wyoming State Office by the Wyoming Natural Diversity Database. University of Wyoming, Laramie, Wyoming. McGuire, L.P. and M.B. Fenton. 2010. Hitting the wall: light affects the obstacle avoidance ability of free-flying little brown bats (Myotis lucifugus). Acta Chiropterologica 12(1): 247-250. McGuire, L.P., M.B. Fenton, and C.G. Guglielmo. 2009. Effect of age on energy storage during prehibernation swarming in little brown bats (Myotis lucifugus). Canadian Journal of Zoology 87(6): 515-519. McManus, J.J. 1974. Activity and thermal preference of the little brown bat, Myotis lucifugus, during hibernation. Journal of Mammalogy 55(4): 844-846. Melendez, K.V. and A.S. Feng. 2010. Communication calls of little brown bats display individual-specific characteristics. Journal of The Acoustical Society of America 128(2): 919-923. Meteyer, C.U., M. Valent, J. Kashmer, E.L. Buckles, J.M. Lorch, D.S. Blehert, A. Lollar, D. Berndt, E. Wheeler, C.L. White, and A.E. Ballmann. 2011. Recovery of Little Brown Bats (Myotis lucifugus) From Natural Infection with Geomyces destructans, White-nose Syndrome. Journal of Wildlife Diseases 47(3): 618-626. Miller, D.H. 1962. Daytime attack on a bat by blackbirds. Journal of Mammalogy 43(4): 546-546. Moosman Jr., P.R., H.H. Thomas, and J.P. Veilleux. 2012. Diet of the widespread insectivorous bats Eptesicus fuscus and Myotis lucifugus relative to climate and richness of bat communities. Journal of Mammalogy 93(2): 491-496. Morrison, M.L. and S. Fox. 2009. Bats associated with inactive mines in the western Great Basin. Western North American Naturalist 69(1): 134-137. Moss, C.F. and D. Redish. 1997. Ontogeny of vocal signals in the little brown bat, Myotis lucifugus. Animal Behaviour 54(1): 131. Mumford, R. E. And J. B. Cope. 1964. Distribution and Status of the Chrioptera of Indiana. Am. Midl. Nat. 72(2):473-489. Nagorsen, D.W. 1980. Records of hibernating Big Brown Bats (Eptesicus fuscus) and Little Brown Bats (Myotis lucifugus) in northwestern Ontario. Canadian Field Naturalist 94(1):83-85. Nagorsen, D.W. and R.M. Brigham. 1993. Bats of British Columbia. Volume I. The Mammals of British Columbia. UBC Press, Vancouver. 164 pp. Nagorsen, D.W., A.A. Bryant, D. Kerridge, G. Roberts, A. Roberts, and M.J. Sarell. 1993. Winter bat records for British Columbia. Northwestern Naturalist. 74(3): 61-66. Natural Resources Conservation Service and Bat Conservation International. 1998. Bats and mines: Evaluating abandoned mines for bats: recommendations for survey and closure. 6 p.
Neuweiler, G. 1989. Foraging ecology and audition in echolocating bats. Trends in Ecology and Evolution 4(6): 160-166. Neuweiler, G. 1990. Auditory adaptations for prey capture in echolocating bats. Physiological Reviews 70(3): 615-641. Norquay, K.J.O. and C.K. Willis. 2014. Hibernation phenology of Myotis lucifugus. Journal of Zoology 294(2): 85-92. Norquay, K.O., F. Martinez-Nuñez, J.E. Dubois, K.M. Monson, and C.R. Willis. 2013. Long-distance movements of little brown bats (Myotis lucifugus). Journal of Mammalogy 94(2): 506-515. Nowak, R.M. and E.P. Walker. 1994. Walker's bats of the world. Johns Hopkins University Press. Baltimore, Maryland. O’Farrell, M.J., E.H. Studier, and W.G. Ewing. 1971. Energy utilization and water requirements of captive Myotis thysanodes and Myotis lucifugus (Chiroptera). Comparative Biochemistry and Physiology Part A: Physiology 39(3): 549-552. Ober, H.K. and J.P. Hayes. 2008. Prey Selection by Bats in Forests of Western Oregon. Journal of Mammalogy 89(5): 1191-1200. O'Farrell, M. J. 1999. Blind test for ability to discriminate vocal signatures of the Little Brown Bat Myotis lucifugus and the Indians Bat Myotis sodalis Bat Research News 40:44-48. O'Farrell, M.J. And E.H. Studier. 1975. Population structure and emergence activity patterns in Myotis thysanodes and M. lucifugus (chiroptera: Vespertilionidae) in Northeastern New Mexico. The American Midland Naturalist 93(2):368-376. O'Farrell, M.J., and E.H. Studier. 1973. Reproduction, growth, and development in Myotis thysanodes and M. Lucifugus (chiroptera: Vespertilionidae). Ecology 54:18-30. Olson, C.R. and R.M.R. Barclay. 2013. Concurrent changes in group size and roost use by reproductive female little brown bats ( Myotis lucifugus). Canadian Journal of Zoology 91(3): 149-155. Olson, C.R., D.P. Hobson, and M.J. Pybus. 2011. Changes in Population Size of Bats at a Hibernaculum in Alberta, Canada, in Relation to Cave Disturbance and Access Restrictions. Northwestern Naturalist 92(3): 224-230. Orbach, D.N. and B. Fenton. 2010. Vision Impairs the Abilities of Bats to Avoid Colliding with Stationary Obstacles. PLoS One 5(11): 1-7. Parkinson, A. 1979. Morphological variation and hybridization in Myotis yumanensis sociabilis and Myotis lucifugus carrisma. J. Mammal. 60:489-504. Patriquin, K.J. and R.M.R. Barclay. 2003. Foraging by bats in cleared, thinned and unharvested boreal forest. Journal of Applied Ecology 40(4): 646-657. Pearl, D.L. and M.B. Fenton. 1996. Can echolocation calls provide information about group identity in the little brown bat (Myotis lucifugus)?. Canadian Journal of Zoology 74(12): 2184. Peck, J. and A. Kuenzi. 2003. Relationship of Orientation on Internal Temperature of Artificial Bat Roosts, Southwestern Montana. Intermountain Journal of Sciences 9(1): 19-25. Perkins, J. M., J. M. Barss, and J. Peterson. 1990. Winter records of bats in Oregon and Washington. Northwestern Naturalist 71:59-62. Poissant, J.A. and H.G. Broders. 2008. Ectoparasite Prevalence in Myotis lucifugus and M. septentrionalis (Chiroptera: Vespertilionidae) During Fall Migration at Hayes Cave, Nova Scotia. Northeastern Naturalist 15(4): 515-522. Powers, L.V., S.C. Kandarian, and T.H. Kunz. 1991. Ontogeny of flight in the little brown bat, Myotis lucifugus: behavior, morphology, and muscle histochemistry. Journal of Comparative Physiology. A: Sensory, Neural, And Behavioral Physiology 168(6): 675-685. Procter, J.W. and E.H. Studier. 1970. Effects of ambient temperature and water vapor pressure on evaporative water loss in Myotis lucifugus. Journal of Mammalogy 51(4): 799-804. Psyllakis, J.M. and R.M. Brigham. 2006. Characteristics of diurnal roosts used by female Myotis bats in sub-boreal forests. Forest Ecology and Management 223(1-3): 93-102. Pybus, M.J. 1986. Rabies in insectivorous bats of western Canada, 1979 to 1983. Journal of Wildlife Diseases 22(3): 307-313. Quay, W.B. 1948. Notes on Some Bats from Nebraska and Wyoming. Journal of Mammalogy 29(2): 181-182. Rabe, M. J., T. E. Morrell, H. Green, J. C. demos, Jr., and C. R. Miller. 1998. Characteristics of ponderosa pine snag roosts used by reproductive bats in northeastern Arizona. Journal of Wildlife Management 62:612-621. Randall, J. and H.G. Broders. 2014. Identification and characterization of swarming sites used by bats in Nova Scotia, Canada. Acta Chiropterologica 16(1): 109-116. Randall, L.A., R.M.R. Barclay, M.L. Reid, and T.S. Jung. 2011. Recent infestation of forest stands by spruce beetles does not predict habitat use by little brown bats (Myotis lucifugus) in southwestern Yukon, Canada. Forest Ecology and Management 261(11):1950-1956. Rapin, N., K. Johns, L. Martin, L. Warnecke, J.M. Turner, T.K. Boilinger, C.K. Willis, J. Voyles, and V. Misra. 2014. Activation of Innate Immune-Response Genes in Little Brown Bats (Myotis lucifugus) Infected with the Fungus Pseudogymnoascus destructans. PLoS ONE 9(11): e112285. Ratcliffe, J.M. and J.W. Dawson. 2003. Behavioural flexibility: the little brown bat, Myotis lucifugus, and the northern long-eared bat, M. septentrionalis, both glean and hawk prey. Animal Behaviour 66(5): 847. Reichard, J.D., N.W. Fuller, A.B. Bennett, S.R. Darling, M.S. Moore, K.E. Langwig, E.D. Preston, S. von Oettingen, C.S. Richardson, and D.S. Reynolds. 2015. Interannual Survival of Myotis lucifugus (Chiroptera: Vespertilionidae) near the Epicenter of White-Nose Syndrome. Northeastern Naturalist 21(4): N56-N59. Reynolds, H.T., T. Ingersoll, and H.A. Barton. 2015. Modeling the environmental growth of Pseudogymnoascus destructans and its impact on the white-nose syndrome epidemic. Journal of Wildlife Diseases 51(2): 318-331. Riskin, D.K. and M.J. Pybus. 1998. The use of exposed diurnal roosts in Alberta by the little brown bat, Myotis lucifugus. Canadian Journal of Zoology 76(4): 767-770. Rodhouse, T. J., S. A. Scott, P. C. Ormsbee, and J. A. Zinck. 2008. Field identification of Myotis yumanensis and Myotis lucifugus: a morphological evaluation. Western North American Naturalist 68:437-443. Rodhouse, T.J., P.C. Ormsbee, K.M. Irvine, L.A. Vierling, J.M. Szewczak, and K.T. Vierling. 2012. Dynamic distribution models for bats: assessing the status and trend of bat populations across broad geographic regions with dynamic distribution models. Ecological Applications 22(4): 1098-1113. Rodhouse, T.J., S.A. Scott, P.C. Ormsbee, and J.M. Zinck. 2008. Field identification of Myotis yumanensis and Myotis lucifugus: a morphological evaluation. Western North American Naturalist 68(4): 437-443. Roemer, D.M. 1994. Results of field surveys for bats on the Kootenai National Forest and the Lolo National Forest of western Montana, 1993. Unpublished report for the Kootenai National Forest. Montana Natural Heritage Program, Helena. 19 pp. Rossillon, M. 1995. The McDonald Mine, west of Ravalli: a cultural resource inventory and evaluation. Renewable Technologies, Inc.. Butte. MT. Unpublished report. 24 pp. Russell, R.E., K. Tinsley, R.A. Erickson, W.E. Thogmartin, and J. Szymanski. 2014. Estimating the spatial distribution of wintering little brown bat populations in the eastern United States. Ecology and Evolution 4(19): 3746-3754. Russell, R.E., W.E. Thogmartin, R.A. Erickson, J. Szymanski, and K. Tinsley. 2015. Estimating the short-term recovery potential of little brown bats in the eastern United States in the face of White-nose syndrome. Ecological Modelling, 314: 111-117. Rydell, J., D.P. McNeill, and J. Eklof. 2002. Capture success of little brown bats (Myotis lucifugus) feeding on mosquitoes. Journal of Zoology 256(3): 379-381. Sasse, D. 1989. Lick Creek Cave - Survey for Bats. White Sulfur Springs, MT: USDA Forest Service, Lewis and Clark National Forest. Report to the district ranger of Kings Hill Ranger District. Sasse, D. C. 1991 . Survey of Tate-Potter Cave. Unpublished report, U.S. Forest Service Belt Creek Information Station, Neihart, MT. 1 3 pp. Schalk, G. and R.M. Brigham. 1995. Prey selection by insectivorous bats: are essential fatty acids important? Canadian Journal of Zoology 73(10): 1855-1859. Scheeter, Jessica and David Zell. 1996. Bat survey of Lower Birch Creek Drainage, Beaverhead National Forest. Schmidt, U. and G. Joermann. 1986. The Influence of Acoustical Interferences on Echolocation in Bats. Mammalia 50(3): 379-390. Schowalter, D.B. 1980. Swarming, reproduction, and early hibernation of Myotis lucifugus and M. volans in Alberta, Canada. Journal of Mammalogy 61(2):350-354. Schowalter, D.B. et al. 1979. Life history characteristics of little brown bats (Myotis lucifugus) in Alberta. Canadian Field-Naturalist 93(3):243-251. Schwab, N. 2006. Roost-site selection and potential prey sources after wildfire for two insectivorous bat species (Myotis evotis and Myotis lucifugus) in mid-elevation forests of western Montana. Schwab, N.A. 2004. Bat Conservation Strategy and plan for the State of Montana. Intermountain Journal of Sciences 10(1-4): 80. Schwab, N.A. and K.R. Foresman. 2006. Roost-Site Selection and Potential Prey Sources After Wildland Fire for Two Insectivorous Bats in Western Montana. Intermountain Journal of Sciences 12(3-4): 133. Schwab, Nathan. 2003. Mine Assessments for Bat Activity on Lands Managed by the BLM, Missoula Field Office 2003. Report to USDI BLM Missoula FO. Missoula, MT. 10pp. Schwab, Nathan. 2004. Mine Assessment for Bat Activity on Lands Managed by the BLM, Missoula Field Office 2004. USDI BLM Missoula FO. Missoula, MT. 16 pp. Secord, A.L., K.A. Patnode, C. Carter, E. Redman, D.J. Gefell, A.R. Major, and D.W. Sparks. 2015. Contaminants of Emerging Concern in Bats from the Northeastern United States. Archives of Environmental Contamination and Toxicology 69(4): 411-421. Segers, J. and H. Broders. 2014. Interspecific effects of forest fragmentation on bats. Canadian Journal of Zoology 92(8): 665-673. Segers, J. and H.G. Broders. 2014. Interspecific effects of forest fragmentation on bats. Canadian Journal of Zoology 92(8): 665-673. Sherwin, R.E., J.S. Altenbach, and D.L. Waldien. 2009. Managing abandoned mines for bats. Bat Conservation International. Stones, R.C. and J.E. Wiebers. 1965. Activity and body weight of Myotis lucifugus at a low temperature. Journal of Mammalogy 46(1): 94-95. Stones, R.C. and T. Oldenburg. 1968. Occurrence of torpid Myotis lucifugus in a cold mine in summer. Journal of Mammalogy 49(1): 123. Storz, J.F. and C.E. Williams. 1996. Summer population structure of subalpine bats in Colorado. The Southwestern Naturalist 41(4): 322-324. Studier, E.H. and M.J. O'Farrell. 1972. Biology of Myotis thysanodes and M. lucifugus (Chiroptera: Vespertilionidae)-I. Thermoregulation. Comparative Biochemistry Physiology Part A: Physiology. 41(3): 567-595. Studier, E.H. and M.J. O'Farrell. 1976. Biology of Myotis thysanodes and M. lucifugus (Chiroptera: Vespertilionidae)—III. Metabolism, heart rate, breathing rate, evaporative water loss and general energetics. Comparative Biochemistry and Physiology Part A: Physiology 54(4): 423-432. Studier, E.H., J.W. Procter, and D.J. Howell, May 20, 1970, Diurnal body weight loss and tolerance of weight loss in five species of Myotis. Journal of Mammalogy 51(2):302-309. Studier, E.H., V.L. Lysengen, and M.J. O’Farrell. 1975. Biology of Myotis thysanodes and M. lucifugus (Chiroptera: Vespertilionidae) -- II. Bioenergetics of Pregnancy and Lactation. Comparative Biochemistry Physiology Part A: Physiology. 44(2): 467-471. Swain, U., and E.W. West. 1999. Surface activity and structure of a hydrothermally-heated maternity colony of the little brown bat, Myotis lucifugus, in Alaska. Canadian Field-Naturalist 113(3): 425. Swenson, J. E. and J. C. Bent. 1977. The bats of Yellowstone County, southcentral Montana. Proceedings of the Montana Academy of Sciences 37:82-84. Taylor, D.A.R. and M.D. Tuttle. 2007. Water for wildlife: a handbook for ranchers and range managers. Bat Conservation International. 20 p.
Thomas, D.W. 1995. Hibernating Bats Are Sensitive to Nontactile Human Disturbance. Journal of Mammalogy 76(3): 940-946. Thomas, D.W. and D. Cloutier. 1992. Evaporative water loss by hibernating little brown bats, Myotis lucifugus. Physiological Zoology 65(2): 443-456. Thomas, D.W., M. Dorais, and J.M. Bergeron. 1990. Winter Energy Budgets and Cost of Arousals for Hibernating Little Brown Bats (Myotis lucifugus). Journal of Mammalogy 71(3): 475–479. Thomas, D.W., M.B. Fenton, and R.M.R. Barclay. 1979. Social behavior of the little brown bat, Myotis lucifugus: I. Mating behavior. Behavioral Ecology And Sociobiology 6(2): 129-136. Thomson, C.E., M.B. Fenton, and R.M.R. Barclay. 1985. The role of infant isolation calls in mother-infant reunions in the little brown bat, Myotis lucifugus (Chiroptera: Vespertilionidae). Canadian Journal of Zoology 63(8): 1982-1988. Tigner, J. and E.D. Stukel. 2003. Bats of the Black Hills: a description of status and conservation needs. South Dakota Department of Game, Fish, and Parks. Wildlife Division Report 2003-05. 94 p.
Tigner, Joel. 2007. Bat hibernacula surveys (in) gated mines, Pryor Mountains, Carbon County, Montana - Report to BLM. Batworks 2416 Cameron Drive, Rapid City, SD 57702. Tigner, Joel. 2005. Active Season Bat Surveys of Select Abandoned Mines in the Thompson River Valley, Sanders County, MT. BATWORKS, Rapid City, SD. 16pp. Tigner, Joel. 2006. Bat Hibernacula Surveys of Select Abandoned Mines in the Thompson River Valley, Sanders County, Montana. BATWORKS, Rapid City, SD. 9pp. Turner, J.M., L. Warnecke, A. Wilcox, D. Baloun, T.K. Bollinger, V. Misra, and C.K. Willis. 2015. Conspecific disturbance contributes to altered hibernation patterns in bats with white-nose syndrome. Physiology and Behavior 140: 71-78. Turner, R. W. 1974. Mammals of the Black Hills of South Dakota and Wyoming. Mus. Nat. Hist. Univ. Kansas Misc. Pub. No. 60. 178 pp. Tuttle, M.D. and D.A.R. Taylor. 1998. Bats and mines. Bat Conservation International, Inc. Resource Publication No. 3. 52 p.
Twente, J. W., Jr. 1955. Some aspects of habitat selection and other behavior of cavern-dwelling bats. Ecology 36(4): 706-732. Van Gelder, R.G. 1956. Echo-location failure in migratory bats. Transactions of the Kansas Academy of Science 59(2): 220-222. Van Zyll de Jong, C.G. and P. Geraghty. 1985. Handbook of Canadian Mammals: Volume 2: Bats. Canadian Museum of Nature. 212 p.
Vanderwolf, K.J., D. Malloch, and D.F. McAlpine. 2016. Fungi on white-nose infected bats (Myotis spp.) in Eastern Canada show no decline in diversity associated with Pseudogymnoascus destructans (Ascomycota: Pseudeurotiaceae). International Journal of Speleology 45: 43-50. Vanderwolf, K.J., D.F. McAlpine, G.J. Forbes, and D. Malloch. 2012. Bat Populations and Cave Microclimate Prior to and at the Outbreak of White-Nose Syndrome in New Brunswick. Canadian Field-Naturalist 126(2): 125-134. Veselka, N., L. McGuire, Y. Dzal, L. Hooton, and M. Fenton. 2013. Spatial variation in the echolocation calls of the little brown bat (Myotis lucifugus). Canadian Journal of Zoology 91(11): 795-801. Vonhof, M. J., and R.M.R. Barclay. 1996. Roost-site selection and roosting ecology of forest-dwelling bats in southern British Columbia. Canadian Journal of Zoology 74:1797-1805. Vonhof, M.J., A.L. Russell, and C.M. Miller-Butterworth. 2015. Range-Wide Genetic Analysis of Little Brown Bat (Myotis lucifugus) Populations: Estimating the Risk of Spread of White-Nose Syndrome. PLoS ONE 10(7): p.e0128713. Wai-Ping, V. and M.B. Fenton. 1988. Nonselective mating in little brown bats (Myotis lucifugus). Journal of Mammalogy 69(3): 641-645. Weaver, K.N., S.E. Alfano, A.R. Kronquist, and D.M. Reeder. 2009. Healing rates of wing punch wounds in free-ranging little brown myotis (Myotis lucifugus). Acta Chiropterologica 11(1): 220-223. Weller, T. J., S. A. Scott, T. J. Rodhouse, P. C. Ormsbee, and J. M. Zinck. 2007. Field identification of the cryptic vespertilionid bats, Myotis lucifugus and M. yumanensis. Acta Chiropterologica 9:133-147. Weller, T.J. and D.C. Lee. 2007. Mist Net Effort Required to Inventory a Forest Bat Species Assemblage. Journal of Wildlife Management 71(1): 251-257. West. E W . and U. Swain 1999. Surface activity and structure of a hydrothermally-heated maternity colony of the Little Brown Bat, Myotic lucifugus, in Alaska Canadian Field-Naturalist 113 425-429. Whitaker Jr., J.O. and B. Lawhead. 1992. Foods of Myotis lucifugus in a maternity colony in central Alaska. Journal of Mammalogy 73(3): 646-648. Whitaker Jr., J.O. and T.J. O'Shea. 2004. Prey selection in a temperate zone insectivorous bat community. Journal of Mammalogy 85(3): 460-469. Whitaker, J., D. Sparks, V. Brack. 2006. Use of Artificial Roost Structures by Bats at the Indianapolis International Airport. Environmental Management 38(1): 28-36. Whitaker, J.O., H.K. Dannelly, and D.A. Prentice. 2004. Chitinase in Insectivorous Bats. Journal of Mammalogy 85(1): 15-18. Wilcox, A. and C.K.R. Willis. 2016. Energetic benefits of enhanced summer roosting habitat for little brown bats (Myotis lucifugus) recovering from white-nose syndrome. Conservation Physiology. 4(1): cov070. Wilcox, A., L. Warnecke, J.M. Turner, L.P. McGuire, J.W. Jameson, V. Misra, T.C. Boilinger, and C.K. Willis. 2014. Behaviour of hibernating little brown bats experimentally inoculated with the pathogen that causes white-nose syndrome. Animal Behaviour 88: 157-164. Wilder, A.P., T.H. Kunz, and M.D. Sorenson. 2015. Population genetic structure of a common host predicts the spread of white-nose syndrome, an emerging infectious disease in bats. Molecular Ecology 24(22): 5495-5506. Wilder, A.P., W.F. Frick, K.E. Langwig, and T.H. Kunz. 2011. Risk factors associated with mortality from white-nose syndrome among hibernating bat colonies. Biology Letters 7(6): 950-953. Willis, C.R., A.K. Menzies, J.G. Boyles, and M.S. Wojciechowski. 2011. Evaporative Water Loss Is a Plausible Explanation for Mortality of Bats from White-Nose Syndrome. Integrative and Comparative Biology 51(3): 364-373. Wilson, D. E., F. R. Cole, J. D. Nichols, R. Rudran, and M. S. Foster, (eds.). 1996. Measuring and monitoring biological diversity: standard methods for mammals. Smithsonian Institution, U.S.A. 409 pp. Wolfe, M.L. and A. Kozlowski. 2006. Bat inventories at Grant-Kohrs Ranch National Historic Site and Little Bighorn Battlefield National Monument, FInal Report. Rocky Mountains Cooperative Ecosystems Studies Unit. Utah State University. Logan, UT. 26 pp. Worthington, D.J. 1991. Abundance and distribution of bats in the Pryor Mountains of south central Montana and north eastern Wyoming. Montana Natural Heritage Program, Helena, MT. Worthington, D.J. and H.N. Ross. 1990. Abundance and distribution of bats in the Pryor Mountains of south central Montana. Unpublished report for the Montana Natural Heritage Program. 20 pp. Wund, M.A. 2006. Variation in the Echolocation Calls of Little Brown Bats (Myotis lucifugus) in Response to Different Habitats. American Midland Naturalist 156(1): 99-108. Zukal, J., J. Pikula, and H. Bandouchova. 2015. Bats as bioindicators of heavy metal pollution: history and prospect. Mammalian Biology 80(3): 220-227. Web Search Engines for Articles on "Little Brown Myotis"